On Friday we updated you on the major tournaments running around the world, including the final tables of the WPT Borgata Winter Poker Open and the Aussie Millions Main Event. Today we’ll get you updated on how those final tables played out, including the star-studded, and extremely lengthy, Aussie Millions Main Event. After 1,036 eliminations the final six players in the WPT Borgata Winter Poker Open Main Event took their seats on Saturday, with Andy Hwang leading the way with nearly 100 big blinds. Hwang made the most of his chip-lead as he would go on to win the tournament and pocket the $730k first-place prize-money. In Australia the Aussie Millions Main Event final table featured seven players, including two of the biggest names in poker, Dan Shak and Patrik Antonius, two high-roller regulars as well as members of IveyPoker.com. Joining them at the table was Asian poker pro, and the only women at the final table, Jay Tan, who would finish in 7th place for $150,000, besting her previous top score of $40k when she finished 5th in the 2012 Macau Poker Cup Main Event. Tan has only been playing live tournaments for two years and already has a quarter of a million dollars in earnings. 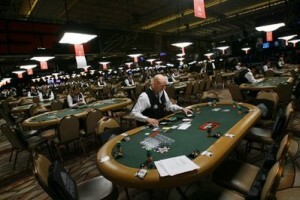 The final table would take two days to complete, considering after 15 hours of play there were still three players alive and kicking. The tournament staff called it a night at this point and play resumed on Sunday. Unfortunately for the two star players, as well as Phil Ivey and IveyPoker.com they would bow out in 3rd place (Antonius) and 4th place (Shak) respectively. The winner, Mervin Chan, had no tournament poker resume whatsoever prior to the 2013 Aussie Millions (Chan cashed in Event #1 of the series for just over $3,000) but with an Aussie Millions Main Event win, and $1.6 million to boot, Chan is now one of the most successful Malaysian poker players in the game! If you think the tournament poker schedule is going to slow down now that the PCA, the Borgata Winter Open and the Aussie Millions have concluded you’d be dead wrong. The European Poker Tour (EPT) is now back in action with their Deauville Main Event underway in France, and the WPT will soon be in Florida for the Lucky Hearts Poker Open before moving on to the Commerce Casino for the LA Poker Classic.